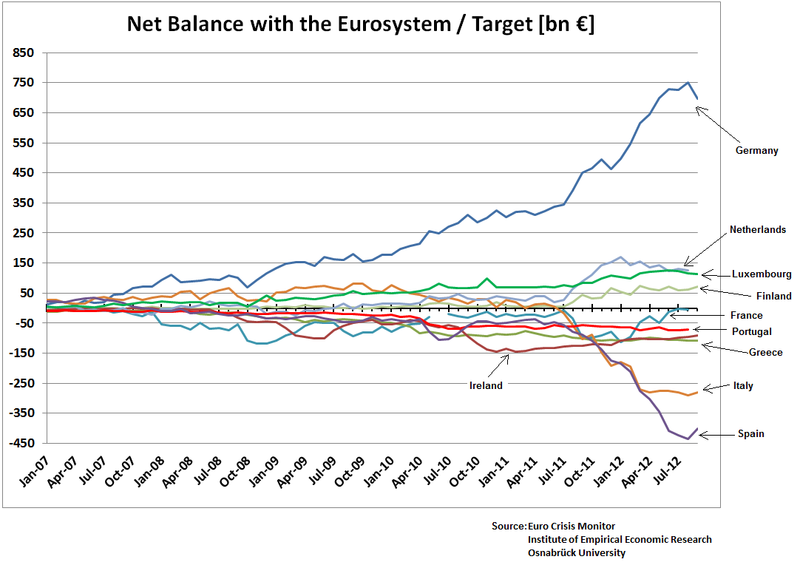 This post is a long overdue look at the infamous TARGET2 (im)balances, which are yet another symptom of the ongoing malaise in the Euro-Zone. I do not claim to make any new contribution in this post, whose motivation was exclusively to summarise my understanding of this issue for future reference. Hopefully, in clarifying it for myself, I will be able to offer clarifications to others. This post begins by describing the TARGET2 system used for clearing and settlements in the Euro-Zone (Euro-Zone + all other countries). Next it provides a description of these imbalances. It then offers some very general facts and links about accounting, clearing and settlement necessary for understanding the next two sections where three literature-relevant examples are given of how inter-Eurosystem TARGET2 imbalances might emerge during clearing. These are followed by an explanation of how imbalances will persist due to settlement problems caused by the breakdown of the interbank market. I then move on to evaluate the merits of those previously discussed alternative sources of imbalances. Before concluding, I offer a review of similar developments in the Ruble zone in the aftermath of the collapse of the USSR. The post is profoundly indebted to previous contributions by Sinn et al 2011, Buiter et al 2011, Wheland 2011 and Wheland 2012, Dwyer 2012, Bindeil and Konig 2011 and Beate Reszat’s and Koning‘s (who I’m fairly sure is the same Konig as above) website. I have also included recent considerations by De Grauwe and Buiter and Rabhari. What is the TARGET2 System? mainly settles operations of monetary policy and money market operations. has to be used for all payments involving the Eurosystem, as well as for the settlement of operations of all large-value net settlement systems and securities settlement systems handling the euro. is operated on a single technical platform. The business relationships are established between the TARGET2 users and their National Central Bank. What this means is that any transaction conducted accross borders in the EMU is processed via the TARGET2 system, where financial operators have an account that can be credited and debited according to their needs. This is irrelevant of whether it is a transfer from an Italian couple to their daughter studying in Germany, a bank transferring money from its Portuguese subsidiary to a German branch, a Dutch corporate buying assets in Spain or Slovenian households importing consumer goods from Austria. 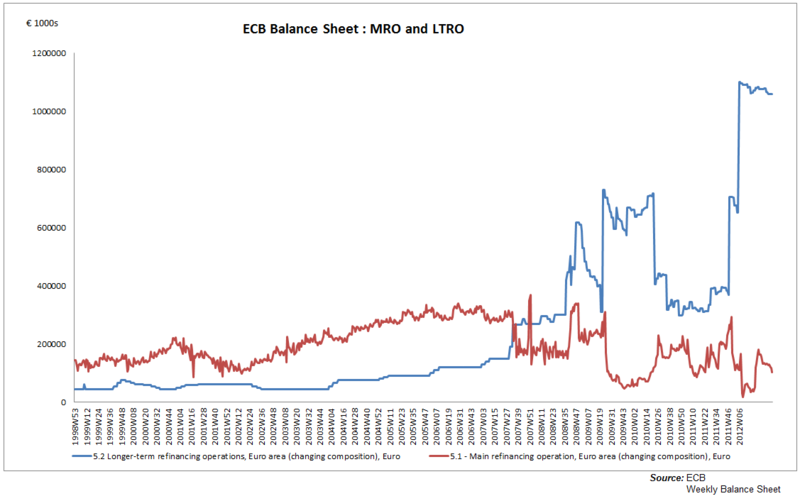 On the other hand, all ECB reverse financing operations are carried out via the National Central Banks (NCBs) according to the relevant central bank open market operation (Marginal Lending Facility, MRO or LTRO), at the appropriate rate and with eligible collateral. Other transactions might also include bonds issuance and other security issuance by SSAs, Banks and Corporations who might also have a TARGET2 account. However, it is sufficient to focus on the accounts of banks and central banks, for the purposes of this post. 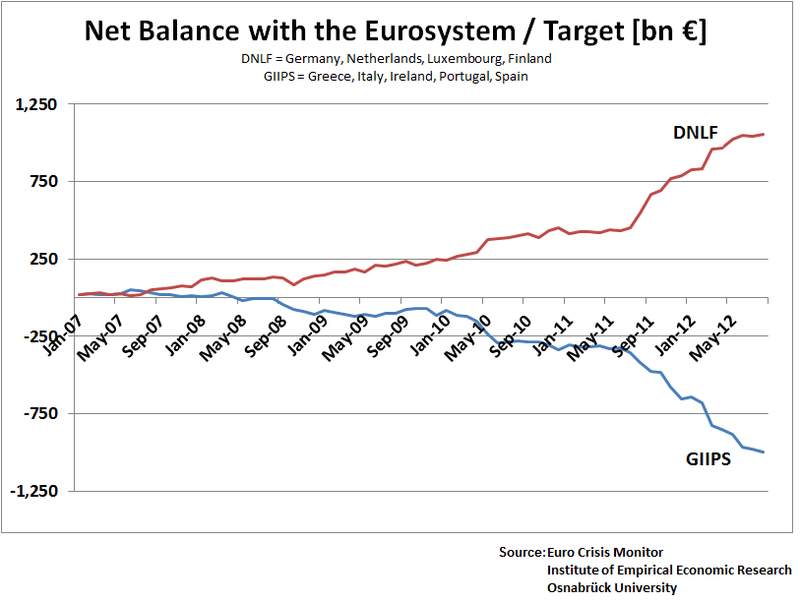 What do Intra-Eurosystem TARGET2 Balances Look Like? The same source is kind enough to cluster the data above by core (DNLF) and peripheral (GIIPS) Euro-Zone central banks. Before moving on to examples of TARGET2 dynamics, it is important to introduce some terminology. First of all, it is important to have some basic grasp of accounting, because that is the best framework available to understand the financial flows at play. As briefly mentioned earlier, accounting is based on a number of procedures and a very important equality, that defines Assets = Liabilities + Equity. For the purpose of understanding the next few sections, all you need to know is that everytime a certain amount is added to the Assets side of a balance sheet, an equal amount must be added in Equity or Liabilities. It is the accounting of claims (assets) and obligations (liabilities ) when the transaction is initiated. This distinction matters because in “the ECB’s Target2 mechanism, the final settling of clearing balances is on hold indefinitely“. So we can have clearing without settlement. 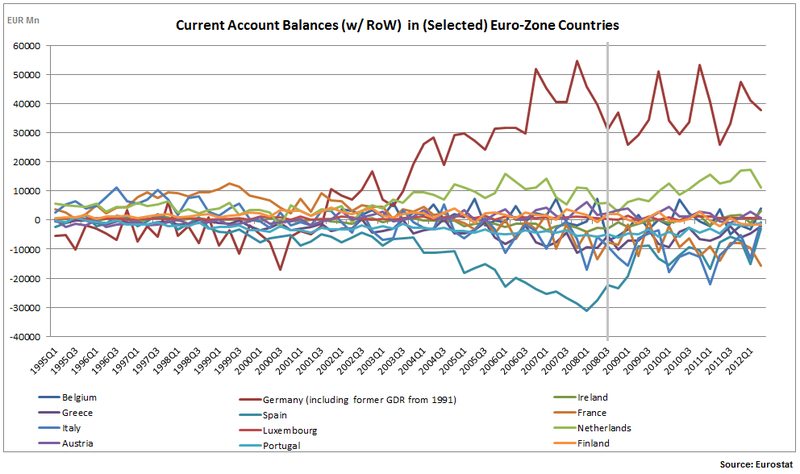 Let’s consider some examples of clearing that lead to asymmetric intra-Eurosystem balances. Current account deficits can occur in one of 3 ways. Because a country receives a donation from another, because a country imports more goods and services or because an “individual or a company of domestic nationality receives money from an incorporate or individual with foreign identity”. Although it does not really matter, I consider the last two. It is also important to remember that due to the accounting mechanics of the balance of payments, current account (CA) deficits tend to be associated with capital account (KA) surpluses. I begin by focusing on Bindeil and Konig’s 2011 example of the latter. 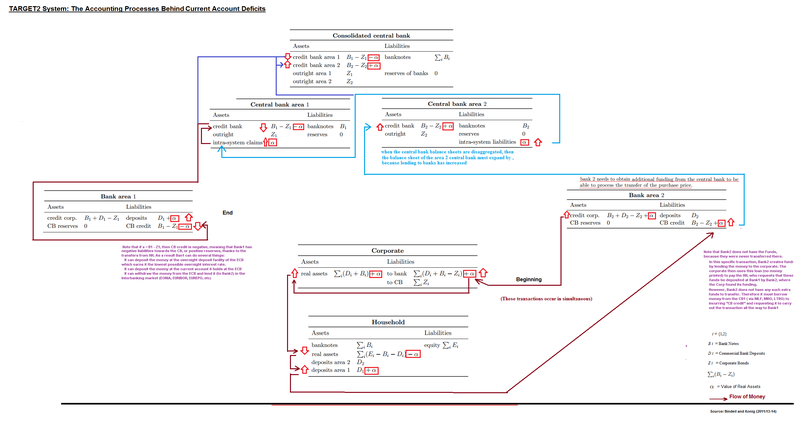 The following diagram shows the mechanics through which a bank in one country (“area 2”) lends money to a corporation established in that country to buy assets from households in the other country (“area 1”), who wants the value of the assets it sells deposited in its account (in “bank area 1”). The operation begins in bank2 who generates the credit for the corporate. This gives it a claim (assets) towards the corporate who in return gets an obligation towards bank2. meanwhile, the corporate takes the credit it obtained from bank2 to buy assets of the household in area1. The increase in the real assets of the corporate leads to a decrease in the household’s assets by the same amount, followed by an increase in deposits, which as specified earlier must go to bank1. To this effect, the household tells bank2 to transfer the value of the assets it sold to bank1. Now, assuming that there are no extra funds in bank2’s reserves, bank2 does not have the actual funds to send to bank1. This is not just possible, but likely. As was shown before, there’s an opportunity cost associated to sitting on cash that is crucial to facilitating the functioning of the interbank market. So in order to transfer the funds to bank1, bank2 needs to borrow the funds from its central bank (CB2) via the MRO, LTRO or the (overnight) the marginal lending facility. CB2 gets a claim on bank2, but not having any extra reserves, ends up incurring an intra-Eurosystem liability towards area 1’s central bank (CB1). 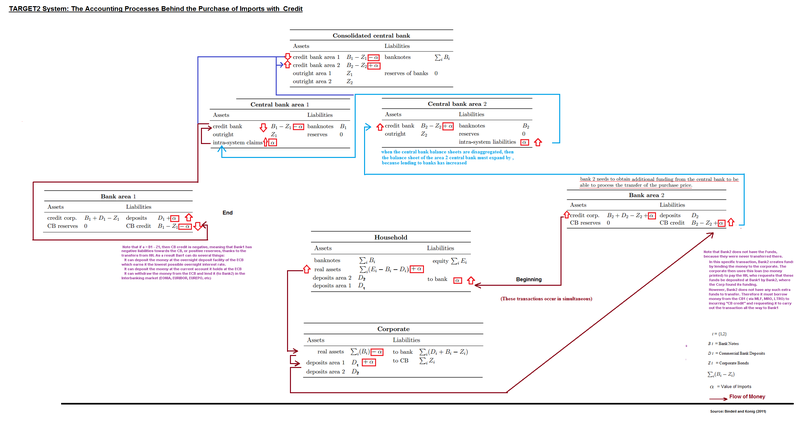 CB1 then gets an intra-Eurosystem asset increase from CB2, while carrying the deposit transfer to bank1, by decreasing the amount of credit owed by bank1 to CB1. Finally, bank1 experiences a decrease in liabilities to CB1, that is compensated by an increase in liabilities to the households who have increased their deposits at the bank. The more familiar case of an import-led current account deficit is extremely similar, discussed by Sinn et al 2011 and Buiter et al 2011. Instead of a corporate buying assets from a foreign household, we now have the more familiar situation whereby a household consumes something produced somewhere else. Aside from the first stages of the above transaction everything is exactly the same, which is why both reflect an equivalent current account deficit financed by credit creation. An entity from area 1 is purchasing assets from another entity in area 2. Whether it is land or goods and services, it does make a difference. Both lead to a current account deficit, unless compensated by opposite transactions. In this case, the corporate in area 2 gets a deficit of income, in that it is purchasing them from abroad. Either of the two examples above is Sinn et al 2011 preferred contender as a source of intra-Eurosystem TARGET2 imbalances, with the balance sheets of the corporate/household, bank and central bank in area 2 rising due to credit creation. The other type of transaction worth considering as a source of TARGET2 imbalances is deposit flight, as described by Bindeil and Konig’s 2011 under the heading of “Capital Transfers”. Deposit flight will generally involve international investors who are large enough to have subsidiaries or branches across several jurisdictions and are consequently able to move their assets between them in order to arbitrate between each jurisdiction and protect the value of their balance sheet. Banks are generally good culprits for this sort of transactions once cross border ownership is possible. It can also happen that actual households move their assets around if different members live in different jurisdictions. For some reason economists seem to have a preference for households conducting such transactions rather than banks, whom I find more likely to do so. Bindeil and Konig’s 2011 assume that a shock occurs (of size “miu”) which is characterised by households reallocating their deposits from bank 2 to bank 1. Again, the shock is negative to area2 but positive to area1. It’s a zero sum game. As to the rest, the mechanics are the same as in the previous cases, except that only the balance sheet of Central Bank 2 rises. This is the preferred hypothesis of Buiter et al 2011.
we can consider the previous two examples from a more economics friendly perspective. Any movement in the current account (CA) or capital account (KA) will be compensated by a movement in the other, assuming as we did before that central bank reserves remain constant. If CA deficit increases (in area2, say Spain), there’s an inflow of funds to that economy (from area1, say Germany). On the other hand, if there’s capital flight, there’s a decrease in the KA of area2 (Spain) and an increase in the KA of area1 (Germany). Meanwhile, as funds leave area2 (Spain) towards area1 (Geramny), then there will be less money available for consumption in area2 (Spain) and more available for consumption in area1 (Germany); coetris paribus consumption (if not imports) should increase area1, eventually leading to a rise in the deficits (or decrease in surpluses) of area1 (Germany) and an increase in the surpluses (or a decrease in deficits) of area2 (Spain). The issue here is that under normal conditions the interbank market would provide the funds to finance the imbalances. However, once the interbank market collapses, the central bank becomes responsible for facilitating these transactions, leading to the TARGET2 imbalances because transactions are not settled. The direction of causality matters a lot here. Note that without loss of relevance, what this section has said is that current and capital account asymmetries may be reflected in intra-Eurosystem TARGET2 imbalances. Whether they are the cause or the effect of those imbalances was not yet argued and cannot as of yet be considered. This is because BoP is about clearing not settlements. Having said that, let’s get on with the causes of those outstanding unsettled intra-Eurosystem TARGET2 liabilities. The examples above show how the imbalances arise, but say nothing of how they persist. Clearly, any of those transactions would have occurred in the first 8 years of the Euro without any problem. In order for them to offer an explanation of TARGET2 imbalances, they must be underpinned by an inability of the relevant NCBs to settle the (cleared) transactions with other Eurosystem NCBs, as per the previous comments from Koning. My understanding is that the explanation below is relatively uncontroversial and I would venture a guess that both Sinn and Buiter agree on this. Nonetheless, it is important to explain and describe it. For the central banks to settle their intra-Eurosystem transactions, they would need to have appropriate assets to do so. This would generally involve gold, gold certificates, cash, or other acceptable measures of the monetary base. In the USA regional central banks do this via their share in SOMA holdings. In the absence of the latter tool, intra-Eurosystem TARGET2 liabilities arising from the intermediation of financial transfers would be settled once banks (in area 2 in the above example) decreased their credit with their NCB. Normally, banks would be able to get the cash to do this from the interbank market, where the bank in area 1, which might end up with extra cash (particularly when would lend the extra reserves to the bank in area 2. However, with the beginning of the crisis, the funds became unavailable, because banks stopped trusting eachother to fulfil contractual debt obligations. As a result, they stopped lending to each other. 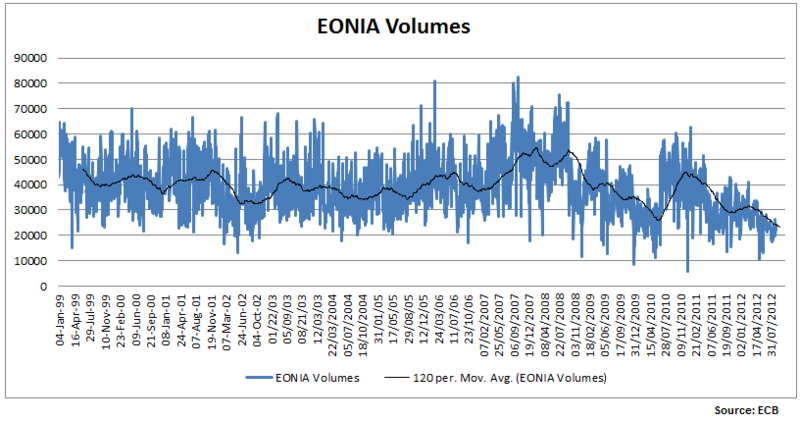 While we saw a short recovery from the Lehman Brothers bankruptcy shock to the Interbank overnight loan (EONIA) volumes during 2010, lending seems to have taken a definitive downwards turn from the beginning of 2011. As a result of the scarcer liquidity, the banks in the periphery (area 2) increased their recourse to ECB funding, mainly via LTRO. This preference at the detriment of the MRO and of thethe Marginal Lending Facility, is probably a function of long-term liquidity preference in times where short term cash seemed able to disappear quickly. 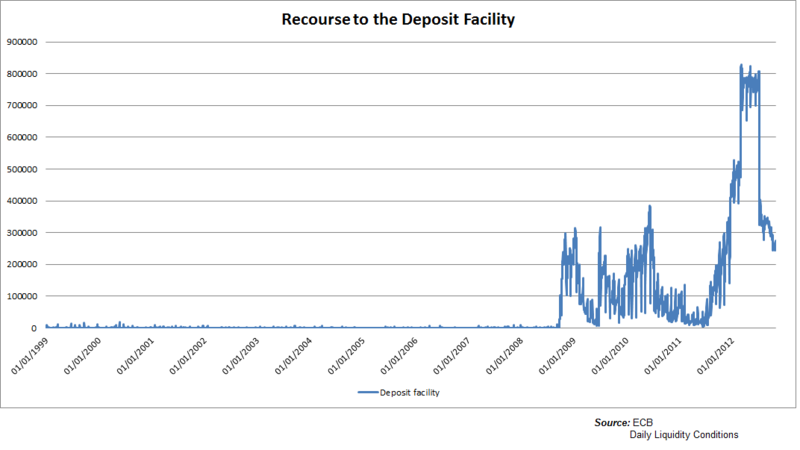 At the same time, and overlooking prior considerations about the sources of volatility, the bank in area 1 decided to put its extra cash (“alpha” or “miu”) into the deposit facility. The situation has recently evolved to gain another dimension. As the overnight interest paid by the deposit facility hit the zero lower bound following the July 5 2012 ECB decision, banks were left sitting on their cash. 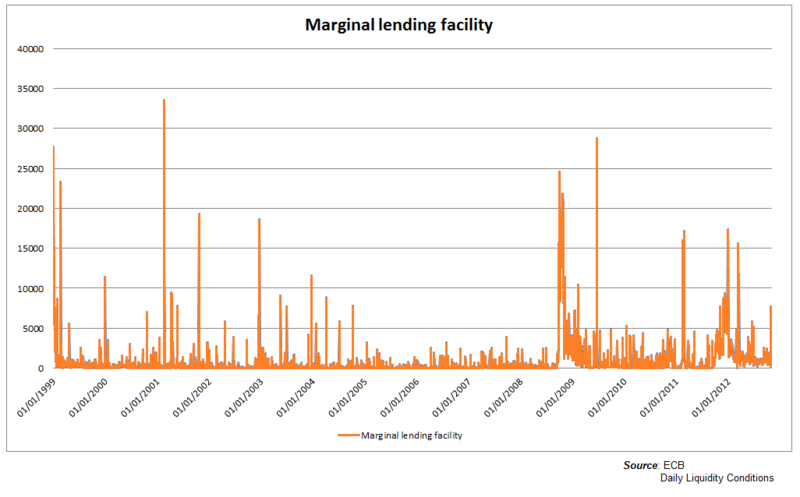 While the idea of lowering the overnight deposit facility to zero may have made sense in terms of decreasing banks incentives not to lend to each other, the persistence of heightened risk in the interbank lending sector means that it is better to sit on money that does not earn any interest rather than allocate it to assets which may become illiquid. 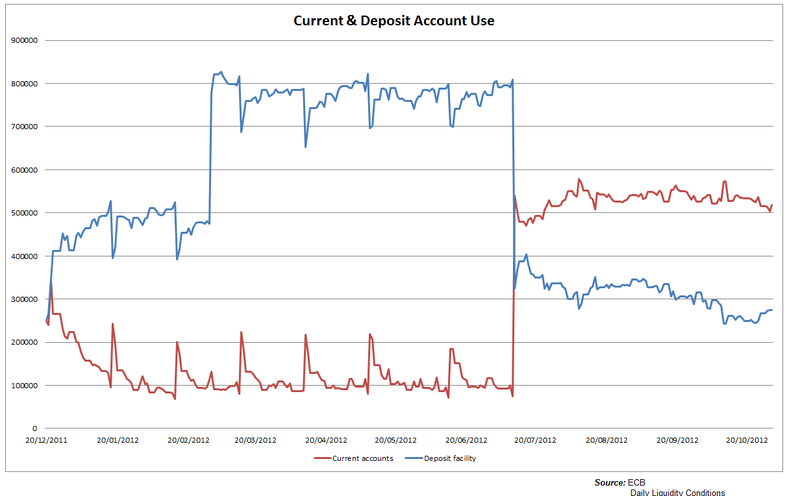 Because banks must request that the funds be transferred to the deposit facility by the ECB, contrarily to the automatism that may apply with the Marginal Lending Facility, the default result has been that there has been a realocation of funds from banks deposit facility with the ECB to their current account. This view is further supported by data from the ECB’s April 2012 Financial Integration Report, which shows that it is not just the interbank market that has shut down. 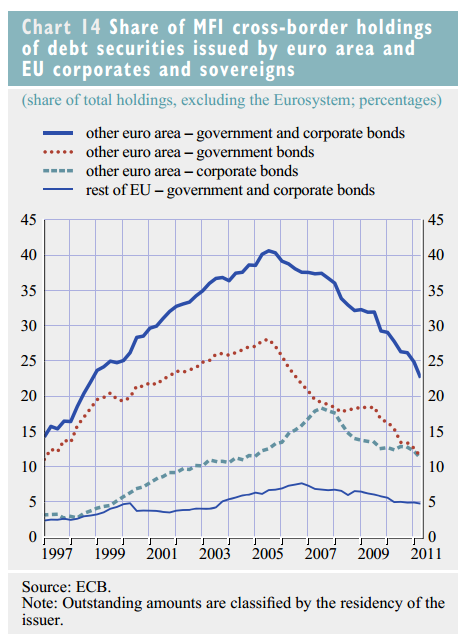 Indeed there has been a general erosion of financial integration in the Euro-Zone. Causes of TARGET2 Imbalances: Funding Current Account Deficits or Capital Flight? 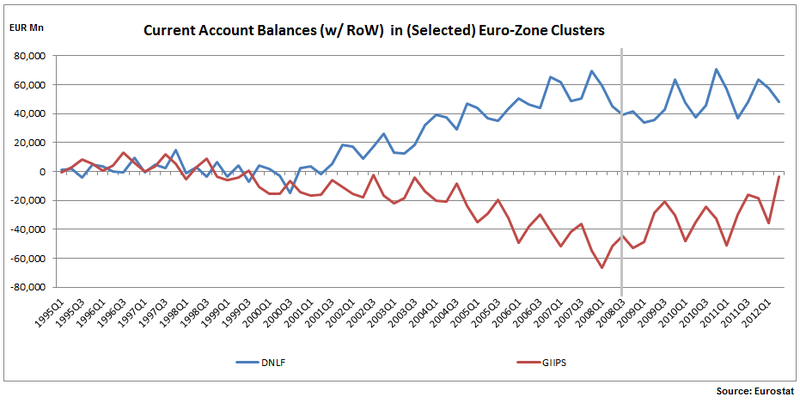 Rather than increasing with TARGET2 imbalances, current account imbalances seem to have decreased. Indeed, while Core current account surpluses with the rest of the world have stabilised, the periphery’s deficits have decreased. So Sinn et al 2011 are wrong. But are Buiter et al 2011 right? Their argument seems supported by data from the Bank for International Settlements. According to it, the volume of foreign loans and deposits in the GIIPS has fallen and risen in DNF since the end of 2010, consistent with capital flight from the periphery to the core. The money is not being used to be lent back because financial markets in the Euro-Zone have become fragmented shutting peripheral commercial banks out of the interbanking markets. By necessity of the liquidity needs, this has pushed them to put their cash at their central banks, the only remaining source of liquidity. Notice that according to this line of argument, periphery banks are not necessarily insolvent, only illiquid, and need to use official funding from the ECB to fund their activities. The previous sections have illustrated how the breakdown of the interbank market has required that the ECB provide the liquidity necessary for the banking sector to survive. In the process, it has created lengthy creditor-debtor relationships between peripheral and core Euro-Zone central banks operating through the ECB. Of course, in principle this is not a problem because all balance sheets are consolidated at the ECB. In practice, however, analysts may fear that events in the Euro-Zone would unfold in a similar manner to those in the former Soviet Union Republics (FSURs) operating under the eventually doomed Ruble Zone, between 1992 and 1994. Following Conway’s 1995 Currency Proliferation: The Monetary Legacy of the Soviet Union, the problem in that instance was driven by current account imbalances rather than by capital transfers. However, although it is not imediately useful to understand what is happening in the Euro-Zone, it is useful to understand the fears innocently voiced by Sinn. There and then, the problem was that non-Baltic Former Sovier Union Republics (FSUR) were allowed to borrow money to facilitate seigniorage and current account deficits. Central banks operated large interest-free overdrafts with the Central Bank of Russia (CBR), similar to those available to Euro-Zone countries under TARGET2, although for different reasons. The credit they received from Russia gave them overvalued purchasing power that allowed them to increase prices abroad (mainly Russia whom they imported the most from). At the same time, the central banks of Ruble Zone countries accumulated liabilites they could not pay, crowding the Central Bank of Russia (CBR) add accumulated overdrafts from FSURs through their unsettled assets. Following the recent independence movements, it was impossible to impose mechanisms to diminish this seigniorage prone system. Given the unsustainable position and irresponsible behaviours adopted by both sides of the ruble zone, it became apparent that these balance of payment overdrafts were likely to suffer substantial real depreciations, due to that monetisation. Basically, FSURs were free-riding on Russia and intended to continue to do so. After several attempts to assist its neighbours with their balance of payments, Russia eventually gave up and required that all balances with the CBR be settled. This made the situation unsustainable for FSURs who wanted to continue to finance themselves through seigniorage. Inevitably the currency union collapsed, accentuating pre-existent hyperinflation pressures in the FSURs (from price liberalisation initially introduced with perestroika) and high costs to the CBR who experienced a severe devaluation of the claims (Assets) it held towards other central banks who used the Ruble. The argument that they made was that the continuation of the currency union would have further increased the costs from a currency union break up, which would have inevitably occurred. This inevitability arose from Russia’s aforementioned inability to enforce a rules-based fiscal-monetary system on the other countries. Clearly the best solution would have been for everyone to stick together and behave well. Hyperinflation would not have occurred, GDP would not have collapsed by as much and aggregate welfare would not have fallen as steeply. Of course this excludes the fact that Russia had started hoarding Rubles following the collapse of the USSR. So everyone was at fault. Conclusion: Should We Worry About TARGET2? The Euro-Zone sovereign debt crisis is worrisome. However, the TARGET2 imbalances are a sympton, not the evil. The settlement problem is not between the commercial banks and the ECB. The settlement problem arises between the NCBs who keep outstanding liabilites/overdrafts with one another at the (necessarily) loose conditions described in the first section of this post. When commercial banks borrow from the ECB, that transaction is settled because the banks must post eligible collateral with the ECB and pay the relevant interest rate. The problem is that this is a liquidityless operation. The NCBs are left with no more acceptable assets with which to settle their positions with each-other. If we want to solve the imbalances, it is necessary to create the conditions for interbank lending markets to return to their proper functioning. This probably requires the creation of tools and mechanisms that guarantee deposits and allows banks to be unwound in an orderly manner, in line with the proposed banking union. While the OMT offered a solution to the risk posed by sovereigns to banks, the banking union was meant to offer the moral hazard-avoiding protection to investors, depositors and ultimately the sovereigns necessary to avoid bank bailouts. This is, as De Grauwe and Buiter and Rabhari have recently argued, largely the responsibility of Germany who has a veto on the agenda of EMU reform and stands to gain as much from doing the intelligent thing. 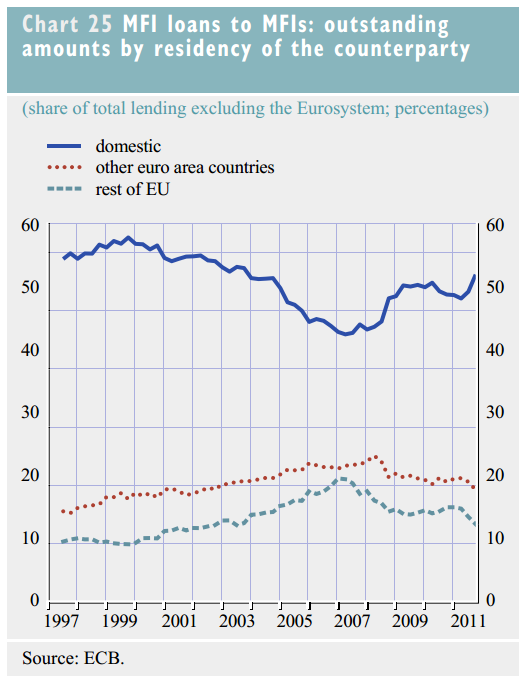 Until then, and as soberlook points out, the system will continue to foster a life-cycle to Euro-Zone lending interdependences between core and periphery as intermediated by their NCBs that creates, prolongs and increases these TARGET2 imbalances. This entry was posted in Aides Memoire, Banking, ECB, Economic Concepts, Finance, Indicators, Inflation and tagged Accounting, Assets, Balance of Payments, Banking Union, Banks, Buiter, Capital Flight, Central Banks, Clearing, Core, Corporates, Current Account Deficits, Deposit Facility, Deposit Flight, ECB, ECB Longer Term Refinancing Operations, ECB's Main Refinancing Operations, Equity, Euro, Euro-zone, Euro-Zone Banking Union, Eurosystem, Foreign deposit flight, Former Soviet Union Republic, Former Soviet Union Republics, FSURs, Germany, Households, ISA, Koning, Liabilities, LTRO, MRO, OMTs, Outright Monetary Transactions, overdrafts, Periphery, Ruble-Zone, Seignioreage, Settlements, Sinn, SOMA, Spain, Target2, TARGET2 imbalances. Bookmark the permalink.